I’m well acquainted with the breakfast cereals aisles in most of the main supermarkets, so I couldn't help but notice this new arrival from Weight Watchers. There are two varieties: Love Fibre Wheat & Rice flakes and Love Fibre flakes with Raisins, Sultanas and Apples. 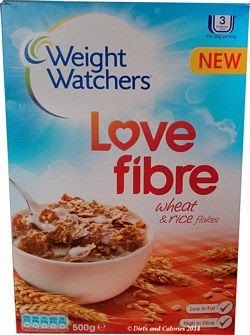 As far as I’m aware, this is the first breakfast cereal from Weight Watchers, at least in the UK. The two varieties come in different sized boxes for some reason. The Wheat & Rice flakes are in the larger 500g box while the Raisins, Sultana & Apple flakes come in a smaller 350g box. 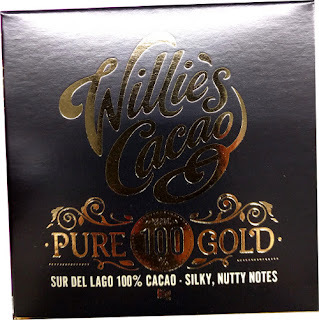 When I first saw them on the shelf, I did want to try them out. But the ridiculous introductory price of nearly £3 meant they were bypassed pretty quickly. However, a couple of weeks later, there they were, on sale, now at a far more reasonable £1.49! 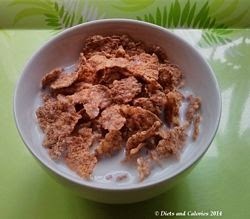 I opted for the plain Wheat and Rice flakes hoping they might taste something like Special K. The flakes are quite large and crisp, a bit paler than bran flakes. They’re fairly sweet and stay reasonably crunchy in milk. And no, they don’t taste like Special K. Instead they’re similar to the Wheat flakes made by Weetabix. To me, they don’t stand out in any particular way from the vast selection of breakfast cereals, apart from the fact that they’re from Weight Watchers. As such, you get to know how many ProPoints each bowl is worth. They recommend a 30g bowl for the plain Wheat & Rice flakes. This comes in at 3 ProPoints. A 40g serving of Raisins, Sultana & Apple flakes provides you with 4 ProPoints. It’s nice to see a Weight Watchers product without the usual ‘hundreds’ of ingredients. 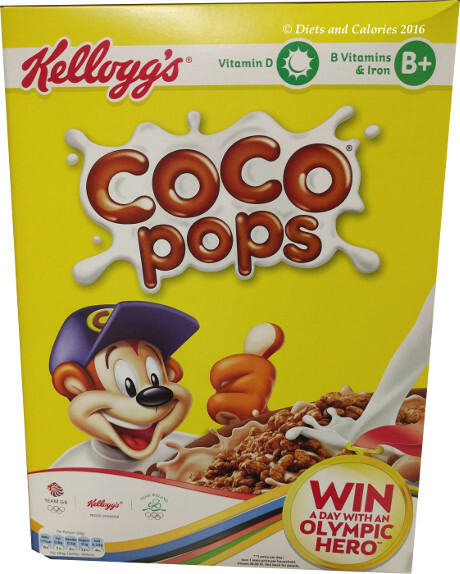 And those included in these cereals seem pretty standard (See below). They are low in fat and saturated fat, with medium levels of salt and a high sugar content. The fibre content is good too. “Weight Watchers Love Fibre flakes are deliciously crunchy, low in fat and have added vitamins and iron. Every flake is made from wheat and rice, and the wholegrain wheat helps make them a great source of fibre. 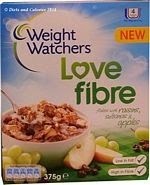 At the time of writing, Weight Watchers Love Fibre breakfast cereal is being sold on a 2 for £3 deal at Tesco. Also available in other main supermarkets. Suitable for vegetarians. 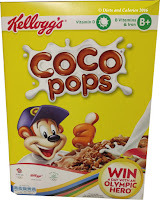 Nutrition information per 100g (Wheat & Rice Flakes): 372 calories (112 per 30g serving without milk), 14.1g protein, 70.4g carbs, 16g sugars, 2.1g fat, 0.4g saturates, 7.5g fibre, 0.6g salt. Nutrition information per 100g (Raisin, Sultana & Apple): 362 calories (145 per 40g serving without milk), 10.8g protein, 72.9g carbs, 28.5g sugars, 1.6g fat, 0.3g saturates, 6.3g fibre, 0.4g salt. Ingredients Wheat & Rice Flakes with Raisins, Sultanas & Apple: Wholegrain Wheat (36%), Rice (21%), Raisins (13%), Sultanas (12%), Sugar, Wheat Gluten, Wheat Bran, Dried Apple Pieces (3%) (with Preservative: Sulphur Dioxide), Malted Barley Extract, Skimmed Milk Powder, Defatted Wheat Germ, Salt, Niacin, Iron, Pantothenic Acid B5, Thiamin (B1), Riboflavin (B2), Vitamin B6, Folic Acid, Vitamin B12.